John Simpson is an accomplished public, keynote speaker and enthralling after dinner speaker, fascinating audiences across the world with his lively and entertaining talks and lectures. With over 40 years experience in international journalism he has the ability to cover topics from highly factual and intense World Affairs to more light-hearted and amusing tales from his extensive travels. 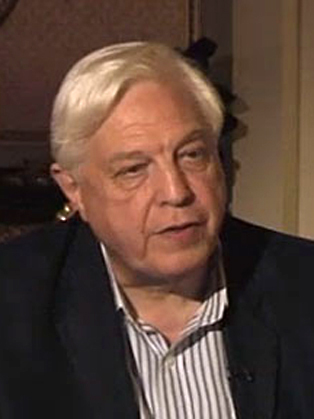 John Simpson is the BBC's World Affairs Editor, the senior member of a team of London-based foreign and specialist correspondents. In a BBC career spanning more than 40 years - he joined as a trainee journalist in 1966 - John has earned a reputation as one of the World's most experienced and authoritative journalists. His first job with the BBC was as a trainee sub editor in Radio News in 1966. John has reported from more than 100 countries across the globe, from 30 war zones and has interviewed numerous controversial world leaders including Sadam Hussein, Osama Bin Laden, Nelson Mandela, Margaret Thatcher, Mikhail Gorbachev, Yasser Arafat, Colonel Gadhaffi, Ayatollah Khomeini, Robert Mugabe and the Emperor Bokassa. One of John's more demanding major assignments was reporting from Afghanistan during the fall of Kabul. John also reported from Belgrade during the Kosovo crisis of 1999. He was one of only a handful of journalists to remain in the Serbian capital when the authorities expelled those from Nato countries at the start of the conflict. "As everyone else was pulling out I decided I would just stay put and see what happened," he said. For the next 12 weeks he filed reports every day and often round-the-clock for all BBC services, and was the first BBC journalist in a war zone to answer questions from Internet users via BBC News Online. In April 2000, he was named RTS (Royal Television Society) Journalist of the Year for his reporting of the conflict. In a career which makes visiting trouble spots a way of life, John says he rarely fears for his safety - even when a Palestinian soldier ordered him to kneel in the road and held a gun to his head and, just recently, when a 'friendly fire' anti-tank bomb was dropped and detonated a few yards from him in Iraq, killing his translator and showering John with shrapnel. Other close shaves include being shelled in Afghanistan, attacked with poisonous gas in the Gulf and dodging the bullets in Tiananmen Square. John also had the honor as a young reporter of being punched by Harold Wilson for asking whether he was about to call an election. John was appointed World Affairs Editor in 1988 following periods as Diplomatic Editor and presenter of the Nine O'clock News. Before that he worked as a correspondent in South Africa, Brussels and Dublin. John also presents a current and political affairs program called Simpson's World. John Simpson's World is broadcast on BBC World and BBC News 24, and is seen in 200 countries. Each edition has an audience that has been estimated at 151 million viewers. In its five years, Simpson's World has interviewed more than a hundred people in over forty countries, and is one of BBC World's most popular programs. From 1990-6 John was associate editor of 'The Spectator'. Since 1996 he has written a foreign affairs column for The Sunday Telegraph. His most recent books include an autobiographical trilogy: 'Strange Places, Questionable People' (1998), 'A Mad World, My Masters' (2000), 'News From No Man's Land' (2002), 'The Wars Against Saddam' (2003) became a 'bestseller' and is now available in paperback, "Days from a Different World" was published in September 2005,"Not Quite World's End" (2007), "Twenty Tales from the War Zone: The Best of John Simpson" (2007) and John's most recent book "Unreliable Source" was published in 2010. John received a CBE in the (1991), and is one of only two people to have been twice named the Royal Television Society's 'Journalist of the Year' (1991 and 2000). Among his other awards have been three BAFTA's, a Golden Nymph Award for his reporting of Ayatollah Khomeini's return to Iran (1979), a Peabody Trust Award for news (1999), a special jury's award at the Bayeux War Correspondents Awards (2002), an International Emmy Award for News Coverage for his report on the fall of Kabul for BBC's Ten O'Clock News (2002), GQ Magazine "Author of the Year" (2003) and in 2004 John received the award from Pan MacMillan for the "Audio Book of the Year" for The Wars Against Saddam (2004). In September 1999, Magdalene College awarded John an honorary fellowship and, in November 2005, John was installed as Chancellor of Roehampton University. Most recently John has received an honorary degree of Doctor of Laws from the University of Leeds and in July 2010 John was presented with the International Ischia Journalism Prize, Italy's most prestigious media award. Born on 9 August 1944, John was brought up in London and Suffolk, and educated at St Paul's School and Magdalene College, Cambridge where he read English and edited the magazine Granta. In September 1999, Magdalene College awarded John an honorary fellowship.